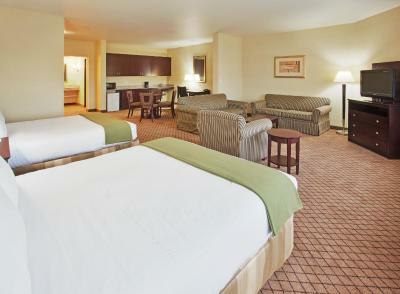 Lock in a great price for Holiday Inn Express Lodi – rated 8.8 by recent guests! Excellent choices for breakfast....lots of healthy food choices along with the hot breakfast. All the staff were very helpful and friendly. The staff were all very helpful, the room was really big and comfortable. Location was fine but needed a taxi into centre. Great staff at front desk and breakfast area. Very clean rooms. Excellent facility. Very clean and very quiet. Parking is adequate. The bed was super comfy and the water pressure in the show was soothing! Staff was very friendly and accommodating. Room was a nice size. Bed was comfortable. Great pillows, good selection for breakfast, very quiet. Holiday Inn Express Lodi This rating is a reflection of how the property compares to the industry standard when it comes to price, facilities and services available. It's based on a self-evaluation by the property. Use this rating to help choose your stay! 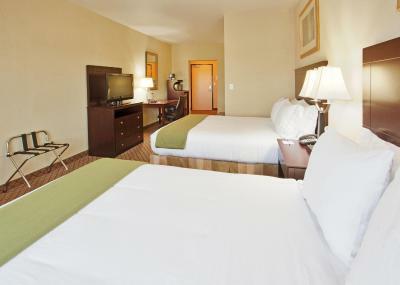 Located between Sacramento and San Francisco, this Lodi, California hotel is a 6-minute drive from Wine Country Casino. It features an indoor pool and modern rooms with a 32-inch flat-screen TV. A microwave, refrigerator and coffee maker are standard in every spacious room at the Holiday Inn Express Lodi. All rooms include air conditioning and a seating area with sofa bed. A daily breakfast buffet is served at the Lodi Holiday Inn Express. Snacks and drinks can be purchased at the 24/7 Sweet Shop. Free access to the 24-hour gym and hot tub is provided to all guests of the Holiday Inn Express. Parking is also free on site. Knowlton Art Gallery and the World of Wonders Science Museum are both 2.5 miles from the hotel. Lakewood Mall and Micke Grove Zoo are a 10-minute drive away. This property is also rated for the best value in Lodi! Guests are getting more for their money when compared to other properties in this city. When would you like to stay at Holiday Inn Express Lodi? Includes a microwave, refrigerator and 32-inch flat-screen TV. Offering free WiFi, this room provides cable TV, sitting area, and a private bathroom. With free Wi-Fi, this room has cable TV, a sitting area and a private bathroom. A roll in shower is featured in this room. A microwave and refrigerator are also included. House Rules Holiday Inn Express Lodi takes special requests – add in the next step! Holiday Inn Express Lodi accepts these cards and reserves the right to temporarily hold an amount prior to arrival. window not locked on arrival issue with door key card made me think "security"
We had a spacious, clean and nice room (King bed). A good breakfast has been provided. Staff has been friendly and helpful. It’s good place to spend a few days to explore the renowned wineries of Lodi appellation. The air con was very very noisy. Our door did not close properly and needed a tug to close, we did not know this and stupidly left it open and someone went in and took drink and $100 which spoilt things. I wish there would have been an in room safe. I didn't like the shower - it was needle piercing hard and apparently not adjustable. After seeing and feeling (before getting in), I decided to skip the shower.